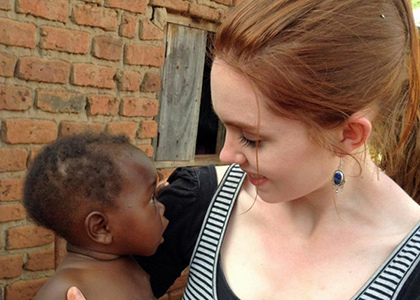 Not a day goes by that Lauren Dobay ’13 doesn’t think about the people she provided care for in Uganda as a senior nursing student in the rural town of Kamuli. Forever etched in her mind are images of hallways lined with critically ill patients at the acute inpatient hospital unit where she worked—a facility that had almost no basic supplies or access to diagnostic testing. Moved by her experience, Dobay helped organize a microphilanthropy scholarship fund to help future nursing students pay for travel to Uganda as part of the travel course “Uganda: Public Health Nursing.” Her effort is part of a larger initiative begun in 2012 by the College of Nursing and Health Sciences (CNHS) in conjunction with the UVM Foundation to fund student-driven microphilanthropy projects. Students create proposals and spearhead fundraising efforts via social media and other marketing methods. Direct donations can be made on the UVM Foundation website.